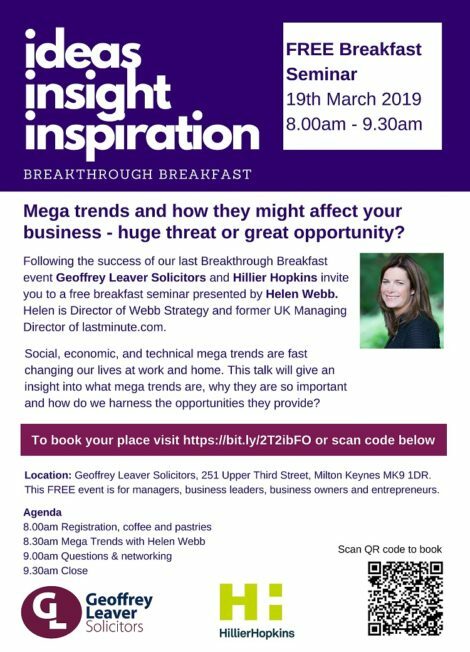 Following the success of our last Breakthrough Breakfast event, Hillier Hopkins and Geoffrey Leaver Solicitors invite you to a free breakfast seminar presented by Helen Webb. Helen is Director of Webb Strategy and former UK Managing Director of lastminute.com. Social, economic, and technical mega trends are fast changing our lives at work and home. This talk will give an insight into what mega trends are, why they are so important and how do we harness the opportunities they provide? Geoffrey Leaver Solicitors, 251 Upper Third Street, Milton Keynes, Bucks, MK9 1DR. Download our flyer for more information on this event. Please note, this event is now fully booked but if you would like to be added to the waiting list or for further information on this event please contact Kirsten Byers on 01923 634252 or email kirsten.byers@hhllp.co.uk.